Set within a small valley in the middle of five mountain ranges (five! ), Tucson is literally surrounded by adventure opportunities. That means everything from leisurely nature hikes to extreme bike rides, downhill skiing (you heard that right) to rock climbing. So if you’re heading to Tucson, grab your gear — it’d be a shame to miss any of these nine outdoor adventures. You know this cactus — it’s the one that looks like it’s waving hello. The saguaro is an icon of the American West, is found only in a couple corners of the world, and grows to giant proportions. They can reach heights of 40 feet and live to be 150 years old, with not the slightest hint of gray hair. The eponymous national park is split into two districts, the eastern Rincon Mountain District (RMD) and the western Tucson Mountain District (TMD). Each is located a 30-minute drive from the center of Tucson. You can choose from over 165 miles of hiking trails (ranging from short introductory strolls to full-day adventures), with the option to stay overnight at one of the six designated campgrounds. Note that a camping permit is required, and sites can only be accessed on foot. Try not to rub up against the stars of the park (spiky!) as you make your way through the desert landscape. Keep your eyes peeled for wildlife — the area is home to javelinas, bobcats, elusive mountain lions, and roadrunners — and petroglyphs, too. Those last are remnants of the Hohokam people, and the best display can be found at Signal Hill in the Tucson Mountain District. This is one of the most difficult road-bike climbs in the entire country, so it’s important to start off right: Grab a big breakfast and a cup of coffee (with a double or even triple shot) at Le Buzz before your ascent. You’ll find the café — which opens for breakfast at 6am every day — on the corner of the Catalina Highway and Tanque Verde Road. From there, you’ll begin the long upward climb along the Mt. Lemmon Highway, also known as the Catalina or General Hitchcock Highway. It’s 6,600 feet of elevation gain over some 27 miles, the 4.5% grade topping out at 9,157 feet in the air. See why we directed you to breakfast first? Your seemingly never-ending ascent finally peaks at Mt. Lemmon Ski Valley, where you can refuel by grabbing a sandwich or slice of pie at the Iron Door Restaurant (open Thursday – Monday). After lunch, it’s quite literally all downhill from here as you turn around and enjoy the same route you just climbed, but this time practically without having to pedal at all. I’ll preface this by saying don’t even think about tackling this downhill ride unless you’re an experienced mountain biker. The trail is stunning in terms of scenery, but it’s incredibly grueling — whether the ride is named for the drop in elevation or the riders who drop from exhaustion is unknown, but it really could be either. To start, catch a shuttle up to the top of Mt. Lemmon, where the nearly 30-mile downhill trail begins from an elevation of close to 9,000ft, ending at the desert floor. As the full Lemmon Drop Ride links up with many other trails along the way (like Green Mountain, Bug Springs, and La Milagrosa), you can customize a shorter ride to your ability or desire. Either way, if you’re up for the challenge, make sure to bring a GPS — the trail is inconsistently marked (i.e., not marked at all in some places). It’s also a good idea to check to make sure your bike’s brakes and suspension are in good working order, and bring along extra water and food as a precaution. While Chiricahua National Monument offers the eight-mile paved Bonita Canyon Scenic Drive, you really need to do an all-day hike to experience the park’s most notable rock formations. The most rewarding-yet-challenging route is called the Big Loop and is accessible from the Echo Canyon parking lot, about a two-hour drive from Tucson. You’ll see tons of unique rock formations along this trail (look for Thor’s Hammer) and about a thousand hoodoos. The loop consists of interconnecting trails, each distinct in terms of the landscape and features it accesses, so definitely meander off your main course if you have time. In general, the trails are very well maintained and easy to follow. The loop is around nine miles, but it can be shortened or lengthened depending on what side trails or shortcuts you follow. It takes most hikers pretty much all day, allowing for several short breaks, so bring plenty of water and wear actual hiking shoes. Don’t miss Inspiration Point — the views from this lookout cannot be put into words. The Cochise Stronghold is located in Coronado National Forest (an hour’s drive from Tucson) and makes for a great backcountry rock climbing experience. The area has numerous multi-pitch climbing routes. Two of the most notable zones are Sweet Rock and Zappa Dome, both of which are accessible year-round. For the record, climbing in Cochise Stronghold should only be done if you’re a skilled climber or are with a professional guide. It’s not just the climbing here that’s difficult — you can easily get lost in the rugged, maze-like terrain. Note: Be aware of closures due to nesting birds of prey. The Rockfellow routes are closed from March 1 through June 30 while birds raise their chicks. Why waste energy hiking or biking Mt. Lemmon when you can just zipline it, amirite? On the backside of the mountain you’ll find the state’s longest zipline span, which comes in at 1,500 feet (stand that on end and you’ve got the Empire State Building, and then some). 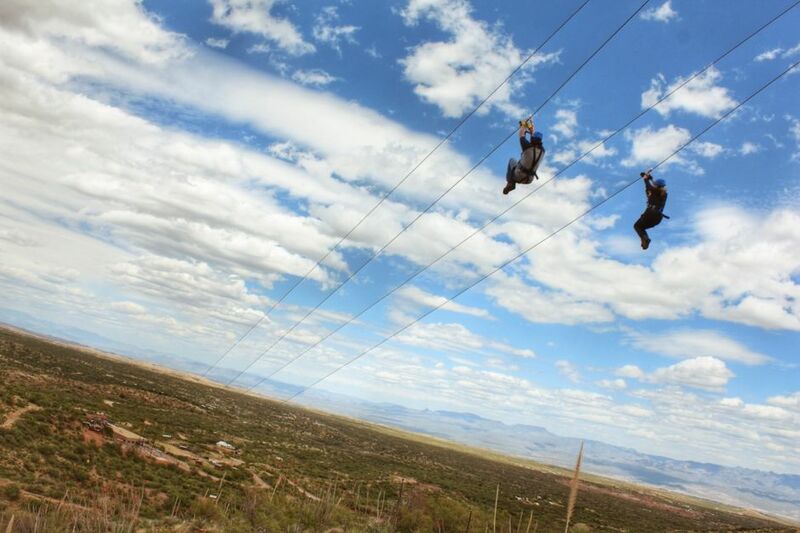 Arizona Zipline Adventures offers the standard ziplining good-times as well as special sunset and moonlight experiences, both of which are available in the spring and fall with a reservation (and are anything but standard). Pro tip: Bring along your GoPro, if you have one. Why would you fling yourself from five different platforms 80 feet in the air without documenting how brave you are? Just as its name implies, Seven Falls Trail allows you to take in seven different waterfalls along its roughly eight-mile round-trip route. The trail is located in the Sabino Canyon unit of Coronado National Forest, about 30 minutes northeast of Tucson. The best time to visit the falls is late winter or early spring, when melting snow and rainfall will ensure the falls are running hard. This time of year also sees the most comfortable temperatures for hiking. The trail is quite popular with both locals and tourists, but you can avoid the crowds by hiking on weekdays and starting before 9am. Expect a few river crossings, pack that extra pair of socks, and don’t even think about going barefoot or in loose sandals — cactus spines aren’t limited to the sides of the plant…they fall to the ground, too. Don’t say I didn’t warn you! Logistics: The best way to reach the start of the trail is to park at the main Sabino Canyon parking lot, which costs $5 per vehicle for the day. You then have the option of taking the Bear Canyon Tram ($4/adult), greatly reducing the distance of your Seven Falls Hike, or you can simply start hiking from the parking lot. Kitt Peak National Observatory features one of the world’s largest collections of high-tech telescopes, with more than two dozen. The generally clear weather and low humidity make this a perfect spot for scientists studying the universe. While you can visit the site during the day to gain knowledge of what the working observatory has accomplished and is currently researching, a night visit is the way to go. You’ll need to make a reservation, as the night programs are popular — you can book online to receive the best rates and find information about closures or cancellations due to cloud cover. Night tours are generally offered seven days a week, barring holidays (and don’t run for much of July and August). The $50 Nightly Observing Program is four hours in total, including a sunset dinner followed by constellation hunting and the free-for-all use of the giant telescopes for close-up views of the cosmos. The observatory also runs more advanced night tours the serious wannabe astronomer, as well as overnight programs with dorm-style accommodations, meals, the chance to capture nighttime images, and exclusive use of research-grade telescopes. The whole experience is a star-studded attraction…minus the red carpet. If you love birdwatching — or simply enjoy a lot of birds watching you — Madera Canyon lies less than an hour south of Tucson and provides some of the best birding in the US. Over 250 species have been documented here, many of which are Mexican species rarely seen anywhere else in the States. The canyon is especially famous for its 15 species of hummingbirds, as well as owls, trogons, and migrating warblers. Some birds — like the vibrant flame-colored tanager — will be easy to spot, while others — like the Montezuma quail — are more camouflaged. And while winter visits will provide comfortable temperatures for hiking the numerous trails offered, you’ll definitely spot a greater variety of species during the summer months. Worth the heat? I’d say so. This post is proudly produced in partnership with Visit Tucson.